Made in Hawaii and infused with a concentrated 25% fragrance, this enchanting Island Bath & Body Maui Tea Rose Perfume spray is packaged in an elegant gift box. Fresh as an island breeze shifting through the palm fronds, this full-strength, made-in-Hawaii Island Bath & Body Island Rose Cologne is packaged in an elegant gift box. This Hawaiian product is the perfect reminder of your island vacation or gives it as a gift of aloha! 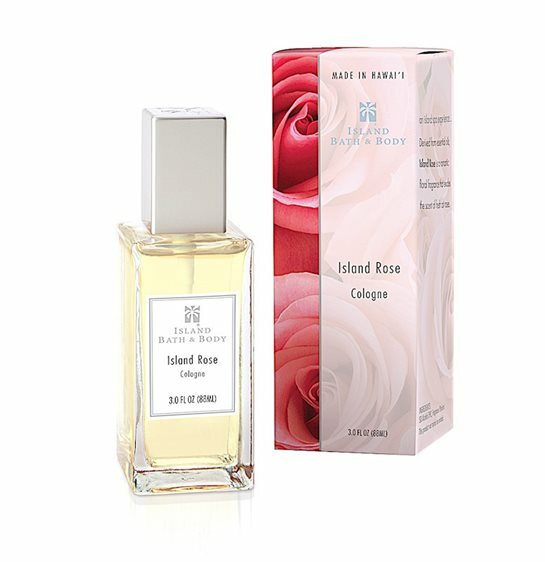 Purchased Item: Island Bath & Body Fragrance [Island Rose] COLOGNE 3 FL OZ. My wife found this perfume several years ago in Hawaii. We were thrilled when traveling through the US that it was available at a chain of stores. After several years they delisted it leaving us no options to purchase. Very excited we can still purchase direct from Aloha Outlet to Canada! Purchased Item: Island Bath & Body Fragrance [Island Rose] PERFUME 1.6 FL OZ. I have tried other rose scented perfumes, but only this one gives me consistent complements every time I wear it. This is a true lovely rose scent. long lasting perfume. Wife found it at ABC during a vacation to Kona. Loved it but didn't know where to find it here. I found it on Amazon and a few other places online but you were a little cheaper (not an issue) and I decided to go directly to the source (your site). Purchased Item: Island Bath & Body Fragrance [Plumeria Vanilla] COLOGNE 3 FL OZ. Need to bring Coconut Vanilla COLOGNE BACK!! I love this fragrance. It takes me back to my visit.